Justin Schaeffer, the only head varsity football coach Murrieta Mesa High School has ever had, announced today that he is resigning to accept a position as head coach at Fountain Valley High. Since the school opened in 2009, Schaeffer has built the program from the ground up, making it competitive in the tough Southwestern League. The Rams' all-time record under Schaeffer is 27-35, but they improved to 5-5 overall last fall and won two league games for the first time. 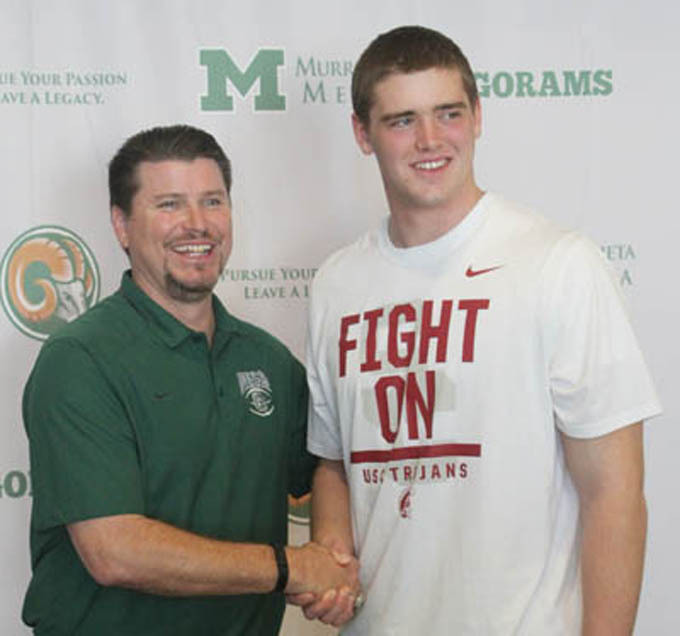 The 2015 Rams featured lineman Nathan Smith, who became the Rams' top recruit ever when he accepted a scholarship to USC (pictured above with Schaeffer). Quarterback Peyton Uhl and linebacker Blake Johnson were also first-team all-league picks. "It is with a heavy heart that I will be departing from Murrieta Mesa High School this spring," Schaeffer said in a press release. "A chance to move my children, my wife and I closer to our immediate family presented itself. It has been my professional life's greatest privilege to have had the opportunity to be on the inaugural Murrieta Mesa teaching staff and to have served as their first head football coach." Murrieta Mesa principal Steve Ellis was complimentary of Schaeffer's contributions to the school. "Justin has been an integral part of Mesa from the day we opened the doors for business," Ellis said. "I am extremely grateful for his tireless effort and commitment to his players and the entire school. "Justin is leaving a program that just had their best season ever in the Southwestern League and they are clearly headed in the right direction. I completely understand his reasons for making this change and I support his decision. I wish him nothing but success at his new position."